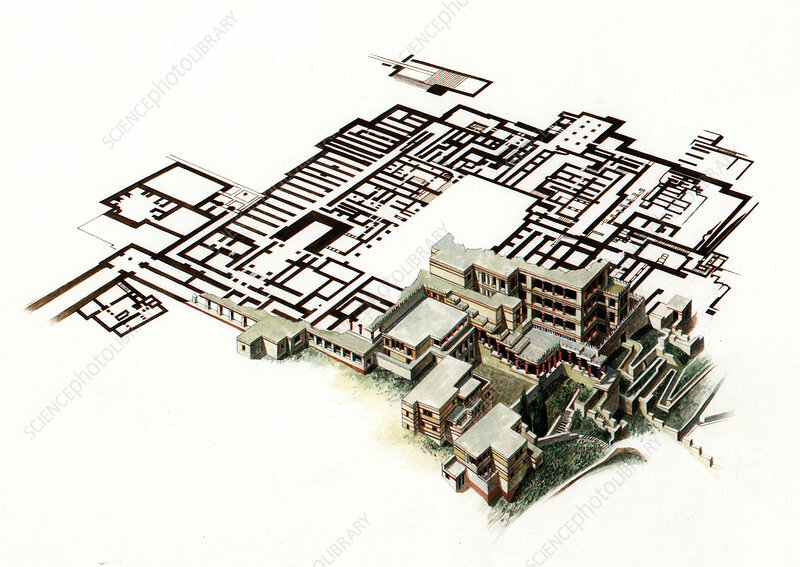 Palace of Knossos, illustration. Knossos, a large Bronze Age archaeological site on the Greek island of Crete, was the ceremonial and political centre of the Minoan civilization. It was discovered in 1878, with later work by British archaeologist Arthur John Evans. Its labyrinth-like nature led Evans to name the civilisation Minoan after the minotaur legend. The main (great) palace is thought to have been built over a period of three centuries from 1700 to 1400 BC. The central court's long axis is aligned north-north-east. At its peak, the palace complex had 1300 rooms, with buildings five storeys high in places, including theatres and storerooms.